The Shieid: The griffin, who is sharp of eye and keen of ear, is an appropriate symbol for the USS GUARDIAN. This mythological beast is also noted for its vigilance, courage, and strength. Its collar, in our National colors, honors the preceding USS GUARDIAN, a Radar Picket Ship launched in 1945. The anchor, adapted from the Rhode Island State flag, and the pineapple symbolizes the ship's first homeport Newport, RI. The total design underscores the Navy's reliance on mine warfare to clear critical sea lanes in the event of war.eld: Dark Blue and gold are the colors traditionally associated with the Navy. The sea is reflected in the crested division and the color white. White recalls sea foam and breakers. The two white interlocking chevron shapes enclosing a detonating mine allude to the ship's cable tethered devices as well as offensive and defensive mining of important sea areas. 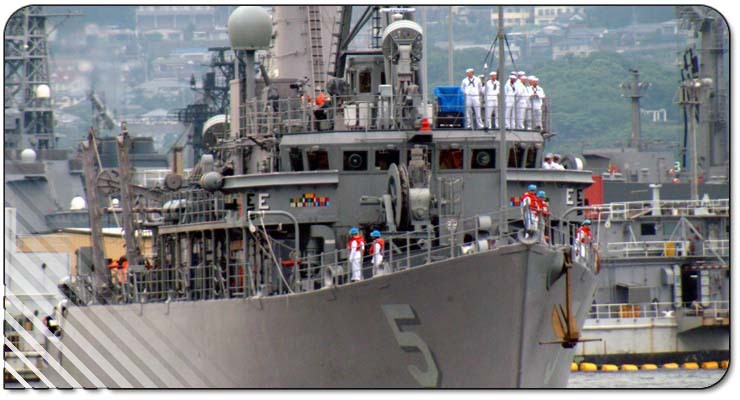 They also personify the MCM's highly sophisticated capabilities of minesweeping to search, detect and neutralize mines. The trident, symbol of sea power, combined with the lightning bolt highlights traditional as well as modern naval warfare. The lightning flash is also a reminder that a high degree of automation and electronics technology is essential for a fast response in mine warfare. 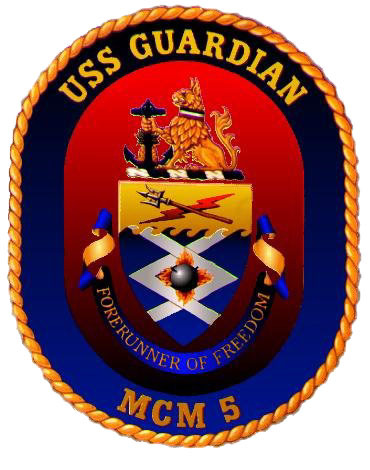 The Crest: The griffin, who is sharp of eye and keen of ear, is an appropriate symbol for the USS GUARDIAN. This mythological beast is also noted for its vigilance, courage, and strength. Its collar, in our National colors, honors the preceding USS GUARDIAN, a Radar Picket Ship launched in 1945. The anchor, adapted from the Rhode Island State flag, and the pineapple symbolizes the ship's first homeport Newport, RI. The total design underscores the Navy's reliance on mine warfare to clear critical sea lanes in the event of war.